I mean, newish. And that would be Macallan, The Macallan. As in Bond, James Bond. But which one shall we tackle first? Maybe the lightest? That couldn’t be the youngest, since one of them – the official, naturally – is one of those pesky NASses. Cant no do verticals with NAS. Yes I do realize that it is not totally fair to have a twenty-seven years old indie Macallan after a humble official NAS. But that official NAS could have been excellent, you never know, there’s always hope. Colour: deep gold. Nose: crikey, you think this is a massacre? Apricots, dried quinces and figs, jams, bitter chocolate, Cuban cigars, Ovaltine, prunes, roasted nuts, parsley, beef stock, orange marmalade, thuja wood, pine cones, jabugo, espresso, heather honey, pinesap... So very typically Macallan! (say pre-2000). With water: black cigars, coffee, proper chocolate, dried dates, prunes, Corinthian currents... This is what the people want. Mouth (neat): it reminds me of the old 10 yo CS (circa 1995 indeed), only with a wider spectrum and that’s the older age. Although those 10s were probably pretty older than just ten... Wonderful meaty chocolate and malt, coffee, many dried fruits, a mineral touch (bordering gunpowder, but it is not gunpowder) then rather herbal teas and roots. Shall we mention gentian and turmeric? I would say this style is still being made – at Glendronach, even if Glendronach seem to be changing a bit as well. With water: just perfect. Ah, memories... Thyme, verbena and wormwood, figs, quinces, a touch of camphor, raisins, and even a little smoke... Oh and kumquats, ‘of course’. Finish: long, a tad more gingery, with a little more bitter orange, Aperol (I know)... Perhaps a little less ‘wide’ now, but on the other hand, it got fresher (mint), so that you would be ready to have another shot or three. Comments: good gravy, not much of a contest, really, not even a ‘duo’, but look, we will recover from this. Glenlivet’s a good suspect as far as these kinds of sessions go. Let’s find two that do bear the same ages, more or less. It’s well-known that G&M have always been Glenlivet specialists, with their own fillings. Colour: straw. Nose: very interesting, rather all on fruit skins, including apples and walnuts, as well as a little paraffin and natural artisanal soap (Alep’s – poor Alep!) A little leather too. In short a rather austere and pretty introverted Glenlivet. After five minutes we’re also finding notes of beer and cider. With water: chalkier, with touches of patchouli and eucalyptus. Bidîs! A little Goa, perhaps… Mouth (neat): big sharp fruits this time, rather exclusively lemons and green apples. Some rhubarb too, well, anything green. Greengages, for example. Add a drop of honey and one of maple syrup, plus a droplet of tabasco sauce that makes it much spicier after three minutes. With water: isn’t this rather Longmorn? A wee touch of tomato. Finish: rather long, leafy, fruit-peely. Tense and sharp. Comments: very good, as expected, even if a little more austere than others. A wonderful and very rare old bottle from wine merchants Christopher & Co. of Jermyn St., London. They had bottled various vintages of Glenlivet, some at cask strength, some at regular strength such as this 25° under proof, so 75° proof, so 42.86% ABV. Colour: white wine. Nose: amazingly medicinal! Camphor and clay crushed and mixed with lime juice, tincture of iodine, cough syrup, mercurochrome, and wet pebbles on a beach. It is to be wondered if the glass of these old bottles did not impart a few mineral notes over time. Some urban legend says that it did, which has not much to do with the taste/smell of light. Some menthol too, as often. Mouth: very firm, very old Highlands, dry and candied at the same time (touches of candied ginger), and much tenser than most old or very old Glenlivets. An obvious rooty/earthy side (our beloved gentian), some crystallised lemons, a touch of kumquat or bergamot, and assorted old oils and juices from old unlabelled bottles. Some manzanilla too, macadamia nuts... Finish: rather long, pine-y, sappy, medicinal, oily. Very salty aftertaste, it’s almost concentrated miso soup. Comments: is this really Glenlivet? Or was this the increased peatiness of the immediate post-war vintages? This is, more or less, artisan white rhum agricole from Madeira. Remember Madeira, just like Martinique, have got an ‘agricole’ appellation, while many other places and products are just shamelessly stealing it. American agricole? Come on! Now Madeira’s also got Cristiano Ronaldo, ha. Colour: white. Nose: hot, extremely cane-y, rather on sweeter meats. Ham cooked in pineapple juice, almond or soy milk, oats, ink (new magazine), porridge, new car, plastics, French beans, Jerusalem artichokes… It really is an unusual spirit, rather different from the white French agricoles. With water: phenols, inks, sourdough, porridge, strawberry yogurt (forgot the name of that famous molecule), perhaps capers… Mouth (neat): a funny sweet and sour spirit, with some ham again, also petroly touches, yogurt, grenadine, bananas, perhaps one black olive (or two or three)… With water: sweeter. Rotting fruits, bananas… Finish: rather long and even sweeter and fruitier. This feeling of overripe pineapples and bananas, plus this petroly touch again. Comments: these traditional Portuguese spirits are very interesting. Cabo Verde’s grogue is worth it too. Obrigado. High Coast = Box. That Box/Compass Box story was totally last year’s WTF story if you ask me. That and Macallan. This bottling’s about oak, apparently, which is normal, as Sweden = Ikea, no? Colour: gold. Nose: oaks and other woods, all freshly sawn. That’s an unusual profile, perhaps not totally kosher in my own book, but there is some action and there is some… sawdust. Wood liqueur? Nutmeg, cinnamon. With water: marzipan, halva and turron galore. Mouth (neat): heavy oak, oak spices, oak sweetnesses, etc. To be honest, this is going a little too far for me. With water: an extreme oaky style. Finish: long and very oaky. A little mad. Eating two packs of speculoos – without anything to drink. Comments: I give up. Love Box/High Coast, it’s just that I believe this is pretty excessive. Plus, deforestation is becoming a worldwide problem, is it not? Now remember, only one man’s opinion. The Dàlvves anytime!!! I thought their ‘Pure Malt 1ère Impression’ was very good (WF 80), but this one is ‘tourbé’, so peated. We’re in the French Alpes. Colour: white wine. Nose: at a baker’s around 6am, while someone’s parked a Corvette just in front of the place. Light peat, fumes, pears, muesli and porridge, wild strawberries. It’s all pretty light, yet pleasant. Mouth: oh not bad at all! Good peat, creamy yogurt, custard, strawberry yogurt, white bread, pears. This is not 1975 Ardbeg, of course, but it’s got teeth and courage. I would have bottled it at a higher strength, though. Like, 45% vol., that’s quite a lot more already. Finish: loses steam (and points) at this point, getting dry and cardboardy. Comments: very nice potential, as they say in French rugby. Well made. No secret that I totally love gentian. This is a new aperitif, bottled at a much higher proof than the regular Suze or Avèze, while it’s not as potent as the eaux-de-vies (the Alsatians, the ones from Franche-Comté, Switzerland, Austria etc.) Let’s check it… Colour: straw. Nose: immaculate earthy/gingery start, getting then more on grapefruits, lemons and lemon grass. It’s got an incredible freshness, very rooty, very beautiful. Gotta love gentian, this MGGA! (makes gentian great again, ha.) Mouth: love it how they managed to balance gentian’s huge bitterness with a little syrup (no ideas as for the recipe, perhaps candy sugar?) and these wonderful earthy touches, white mushrooms, celeriac, turnips, aniseed, fennel, dill, wild carrots… An artful composition, of which any serious spirit lover could quaff hectolitres – provided you drink it fresh or even chilled. Gentian always likes coolness. Finish: long, herbal, earthy, rooty (obviously). More celeriac, lemon and mint. Comments: very, very, and I mean very well composed. But then again, I am a gentian freak. Always have a bottle in the fridge – who needs vegetables anyway? This is supposed to be ‘New Western Style Gin’, which may mean post-Brexit. Or not. Well, in my book and as I may have written or said before, gin’s rather unnecessary a spirit, I would prefer all unaged eaux-de-vies, mezcals, blanches, slivovitz, baijus, you name them, over gin. As the other guy once said, having gin instead of, say good mezcal is like dumping Salma Hayek to go out with Theresa May (not my words, really). Plus, everyone’s making gin these days. You know, time-to-market, cash flow, etc. But there, let’s try this baby, at least it’s not pink (or blue, orange, purple etc.) Colour: white. Nose: right, lemons and lime. Grandma’s limoncello. And?... Mouth: sure it isn’t bad, and even pretty good, but what does it bring to civilisation? Lemons? Finish: medium, lemony. I repeat, medium, lemony. Comments: it’s good, perhaps even very good, but it’s not my cup of booze. But it’s good, technically speaking. There’s already been many 1992s by the indies and most were beautifully fruity. Plus, with this kind of distillate, the word ‘refill’ always rings good to my ears. Colour: gold. Nose: chalky apples and lemons, that’s what I get at first nosing. Also damp raw wool, fresh plaster, crushed aspirin tablets, green pears, green plums, grapefruits, concrete… In short it's a very vertical, or almost binary malt. As I said, chalk and apples. With water: works extremely well, getting more complex. Earthy teas, a touch of umami, even sake, natural white wine (whatever the grapes)… Mouth (neat): totally in line, plus ginger, turmeric and artichoke. So yes, chalk and apples, concrete and grapefruits, plaster and greengages, and pepper. With water: touches of cinchona, Aperol (joking), ginger, more chalk, white pepper, grapefruit skin, fino sherry… Finish: rather long, dry, wonderfully bitter, chalky, a notch fermentary (white beer). Comments: excellent, as expected. Reminds me of my turbulent schooldays with all this chalk! Perhaps a similarly aged older one, if you see what I mean? This is most certainly G&M stock, although they wouldn’t have said so on the labels. The extremely engaging Mr. Fiori used to be behind this series if I’m not mistaken. Colour: full gold. Nose: really unusual, like many malts used to be in the 1950s and 1960s. Who would have blended coconut water with brake fluid, Woolite and lanolin, who? And added a few slices of ripe Provence melon and nectarine for good measure? With water: melons and apricots have taken the lead, which is really very Longmorn in our book. Mouth (neat): huge, and immaculately tropical this time. Mangos, passion fruits, pink bananas, papayas, guavas. Crazy, and come to think about it, compadre Benriach was similarly tropical around those times (late 1960s to mid 1970s). With water: just totally splendid, unfolding rather more with citrus fruits, especially oranges and citrons. That touch of chalk in the background, perhaps. Finish: long, a tad more resinous, very faintly rubbery, although still beautiful. Comments: one of those great Longmorns bottled at their peak. Not saying that they wouldn’t have further aged gracefully, naturally. Not too sure it’s not TDL, so Trinidad Distillers Ltd (Angostura), instead of TLD as mentioned on the label. Does that really matter? Colour: gold. Nose: it’s solid Caribbean rum, not as ‘deviant’ as Caroni, even light Caroni, but there is some grassy cane-iness to it, notes of fermenting bananas, cherry and peach leaves, while it would get more floral over time, with rose petals, orange blossom, also sweets, marshmallows, candyfloss, vanilla... With water: greens, vegetables, tomato stems, fig stems... That’s quite interesting! Mouth: solid rum with some agricole parts, some liquorice, aromatic herbs, thyme, fermenting bananas and pineapples, melons, peaches, more bananas... It’s perhaps a tad too ‘columny’ for me, so a tad empty as they say for grain whisky, but as far as this style is concerned, I don’t think you could do much better. Nice touches of tar. With water: more towards tar, liquorice, salt, rubber... Finish: rather long, grassy, a bit austere now. Less menthol than in other TDLs I could try. Comments: very fine, much less ‘empty’ and dull than you would expect. And certainly not as sweetened-up as most officials from TDL! Possibly some rum from Valera Hermanos. Pure speculations! Colour:amber. Nose: typically Central-American, easy, light, with some pastries, roasted hazelnuts, walnut cake, and pecan pie. Some oak as well, but it’s absolutely not oak juice despite those ‘genuine’ 23 years in wood. No cheating ‘solera’ here. Fine nose! With water: some honey-glazed ham, which is cool and nice. Dates, prunes and cured ham. Mouth (neat): perhaps a tad sweet this time, but there’s really a lot of caramel and liquorice, a combo that rather works in this particular context. Some good tarry cane juice as well, and a touch of oregano. With water: excellent, rather on liquorice and menthol this time. One black olive! Finish: long, grassier, with a further development on green tea and rosemary. Comments: not totally a surprise but... yeah, it’s a surprise. An excellent surprise, while most other Panamanians tend to revolve around the 75-mark in my book. I believe this is a self blend, or a single blend, that is to say a blend of batch and column rums from the same distillery, as many distilleries do without telling anyone. Now whether this was blended at birth or just before bottling, I don't quite know. Colour: gold. Nose: wee whiffs of varnish and vanilla for a start, which would remind us of some bourbons, then a rather light development on patchouli, Virginia tobacco, praline, orange blossom water, strawberries, and wee sweets. The jury’s still out... With water: it does like water, getting cake-y, almost malty at times, with big notes of warm panettone and honey-roasted cashews. Mouth (neat): Martinique? Really, Martinique? Oranges, cane juice, caraway liqueur, marmalade, nougat... With water: a wee tad thinner than on the nose, but balance is good, with oranges and tangerines, melons, and a little eucalyptus. Finish: medium, a touch more candied at first, then drier and more herbal. Cane juice in the aftertaste, always good news (as long as it’s about rum, ha). Comments: same territories, same ballpark, looks like we’re having the best of ‘lighter’ rum today. Another ‘single blended rum’ that, I believe, was blended at birth and matured for 12 years in Madeira wood then 2 years in bourbon. It was bottled in 2017 but issued much later in the end of 2018, while an earlier 'Velier 70' version was available earlier. Colour: dark amber. Nose: it’s really nice to have this one after its younger compatriot, for it is bigger and more batchy (yep indeed we’re afraid of no barbarisms) while styles are not dissimilar. Cornflakes, roasted nuts, pecan pie, sandalwood and cedar wood (pencil shavings), possibly from the bourbon oak, then mint and liquorice, a little aniseed and wormwood, and some kind of pineapple jam and chutney. With water: lovely menthol, violets, roses, liquorice, thuja and rose woods, and more liquorice. Touches of Timut pepper and a little wood smoke. Mouth (neat): really very good, with a lot of very-well-integrated oak (a miracle), mango jam, cloves and strawberry jam, peppered apricot jam (should anyone dare doing that), then Thai spices, coriander, a little ramson, and a welcome tar/liquorice combo that’s less wham-bam than elsewhere. Like, in Jamaica. With water: more jams and preserved fruits! Cherries, peaches... Finish: long, fruity and firm, while you would feel that some work was done with bourbon wood. Good work IMHO. Comments: let this one breathe a bit and it will deliver. Some very excellent medium-bodied rum. This one’s fully ex-column, so let’s expect something relatively light and ‘thin’ despite the high strength. We’re talking high or multiple columns, not créole. Colour: amber. Nose: ah no, it’s not that thin! Love these notes of parsley and lovage that come totally unexpected. Osso buco, fermented soy, umami indeed, sourdough, leaven, tobacco... I rather love this! (indeed, unexpected). With water: indeed, lovely, with some Assam tea, tobacco, yellow jams, praline, butterscotch... Mouth (neat): it’s not kept all of those fermentary/Japanese notes, and got rather caky and candied, with a thinnish middle and notes of Fanta and orange drops. Still fine! With water: no, some are back. Milk chocolate, liquorice, some pepper, salty chicken soup (just a wee drop), more orange squash or Fanta... Finish: medium, with more oranges and a little salt and pepper. Comments: very good, a bit between two worlds (of rum). I’m kidding. We all know that’s impossible! But seriously, you must remember the third film in that Kurt Russel trilogy from the 1980s... Maybe it only got a limited release in Scotland. Anyway, I’m increasingly fond of Glen Scotia these days. While it doesn’t always hit the mark, it is one of these distilleries that has certainly improved over the past twenty years. And its rather idiosyncratic distillates never lack charm in my view. This is lightly peated Glen Scotia matured in bourbon casks apparently. Colour: gold. Nose: there is indeed peat. A rather medical and coastal style that seems to be emblematic of these lightly peated Scotias. I get salty butter, hot cross buns, smoked grains, cereals, hot wash and a wee glimmer of fruits underneath - things like ripe melon and citrons. Rather impressive I have to say. Mouth: rather simple with these notes of smoked hay, straw, raw barley, roast potato, grass, olive oil and a few stray bits of lemon peel. Perhaps some beach pebbles and dried rosemary as well. Unusual but rather fun. Finish: surprisingly good length. Smoked oatmeal, oatcakes, cereals, soot and crushed seashells. Comments: This humble little Glen Scotia is really quite charming. If they gave it an age statement of 5 or 8 years old it would add a further notch of class I think. But, as it is, it’s an easy an quaffable youngster that feels refreshingly un-doctored by active oak. SGP: 463 - 82 points. SGP: 662 - 90 points. 16 years in bourbon followed by 9 in an ex-Chateau Pétrus red wine barrique. Better put my crash helmet on. Incidentally, IAAS stands for ‘It’s All About Springbank’. I believe they are locked in a state of perpetual war with the ‘It’s All About Speyburn’ society. Colour: deep rosé. Nose: it is indeed Springbank. Lots of seashore pebbles, hessian, lemon rind, coal hearth, dunnage and touches of wax and brine. The wee sooty touches mixed with moss, bracken and a few fruit jellies are very lovely. A wee touch of peat and earthy phenolics rising in the background. Mouth: Hmmm. It kind of splits in two here. The wine influence is just too jammy and cloying for me. Although, there is a kind of geode core of preserved classic Springbank hidden inside. Some rooty, earthy peat, some dried seaweed and touches of ripe green and yellow fruits. But the integration just is quite there. Some nice notes of black pepper, beef stock and bouillon, but you can’t get away from the wine. Finish: long but also jammy and tannic, a little too cloying once again. Comments: There’s much to enjoy here. And I’m sure that some noble chums will enjoy them more than I do. I just don’t think these kinds of excessive wine finishings work I’m afraid. Even with longer, second maturations like in this case. But it could well just be me. SGP: 472 - 79 points. Not sure when this one was distilled, but probably circa 2000. Colour: deep amber. Nose: a clean one. Bags of soot, earth, bitter chocolate, black tea, game terrine, marzipan, frying pancetta, walnuts, dried herbs, wax, salted caramel, camphor and plain old dunnage warehouse. With water: leafier, more tobacco, more citrus peel, more nicely structured mineral sherry. Cocoa. Pretty typical and elegant development. Mouth: when Springbank and sherry combine, sometimes it can be a tad monstrous, but here it treads a fine tightrope. Some slightly grubby notes of pencil erasers but also mushrooms, struck flints, saline minerals, blood orange and lightly tarry rope. Increasingly meaty as well with big notes of anthracite and cough syrups. With water: nice, more dark fruits and more leathery qualities. Although, in time, also some slightly more grubby aspects as well. Getting a bit unsteady on that tightrope. Finish: medium, rather chalky, getting drier, more bitter chocolate, walnut oil, spiced mead and a touch of herbal peat. Comments: All very good, a tad too beefy in places to get to 90 but it’s a solid, mid-aged sherried Springbank. The dirtiness is more of a natural dirtiness, which I quite like, but I suspect some would find it a bit too over the top. SGP: 572 - 87 points. 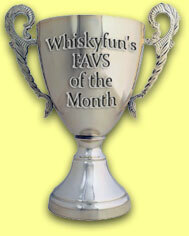 Well, look at that, Glen Scotia won! Isn't it nice when the underdog triumphs. Thanks to Stefan and Julien. 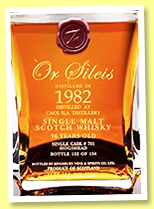 Orcines is an excellent little range of malts by The Whisky Lodge in Lyon/Lyons, France. This should be easy and fast... Colour: white wine. 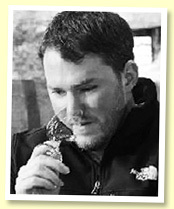 Nose: ah good, some ex-American oak sauvignon blanc at cask strength!. So custard, rhubarb pie, touches of fennel and celery, perhaps beets, some soft IPA beer, hints of sesame oil... All is fresh, fine, and pretty mature. And mucho cool since the owners of the distillery tend to rather finish their young malts in unlikely wine casks. Mouth: fresh, very malty, on cake, muesli, banana pie, café latte, then drops of lemon liqueur and a little liquorice. Good body. Finish: medium, custardy, with some butterscotch and a little ale in the aftertaste. Or stout. Comments: some totally natural and pretty flawless young malt whisky. Not expensive and yet not budget at all. Well, will adding legendary characters to the label and calling the range ‘Legends’ make the whisky... err, legendary? Let’s see... Colour: white wine. Nose: in truth this is the Orcines, only at cask strength. Which translates into a harsher nose, and a more eau-de-vie-ish aspect. Raw kirsch, melon spirit and ‘stuff’. With water: totally a sister bottling of the Orcines now. Indeed looks like I nailed the 46% vol. (and proud he is, oh my!) Mouth (neat): malt, cake, peanuts, ale, Guinness, muesli, Golden Grahams, Ovaltine... With water: butterscotch and ale once again, malt, cakes, cappuccino, banana cake... Finish: same. Medium length. Comments: let us remain consistent. One of the first two bottlings by famous anonymous satirist and polemist the WhiskySponge. You know, the guy who either calls me Jasper Clementine, or makes me ‘speak’ with a terrible French accent and say very silly things about our favourite drink. So in theory, I should retaliate and seek revenge now, but as Melancholic Pony, chief of the Kickapoos of the North once said while smoking his favourite calumet, ‘the law about an eye for an eye leaves everybody blind’. So let us try to remain totally fair here and write just what we think... Colour: deep gold. Nose: fresh croissants, this morning’s kougelhopf, Fruit Loops, acacia honey, maple syrup, honey-coated pearl barley, natural vanilla, and then preserved papayas served in a mild honey sauce. Distant whiffs of new wool, men’s clothing shop, new tweed... Mouth: very good. We’re in similar territories as those of those Glen Grants or Caperdonichs 1972s that had stirred the hearts of many aficionados a while ago, with just the right balance between pollen, beeswax, chocolate, and roasted nuts (or halva, turron and all that). A wee tea-ish side too, touches of cedar wood, herbal teas, all-spice, cinnamon... All things you might expect to find in a 38 years old malt whisky that remained fresh and perfectly alive. Finish: medium, a tad more tea-ish, which is totally normal. A little tobacco, perhaps? Oranges as well. Comments: I have it from a reliable source that The Sponge is actually the estranged son of Jim Murray and a retired pole dancer from Wick, but apparently, that did not prevent him from being able to select an excellent old cask of Glen Moray. Very well done, Mr Sponge! I agree it’s not young, but doesn’t 1996 sound like yesterday? Comes with a photograph of the distillery’s mashman on the label (when this was distilled). Colour: pale gold. Nose: malt, barley, butterscotch, shortbread, Golden Grahams, buttered sweetcorn, brioche, milk chocolate, energy bar, overripe apple, just one tiny raisin. Classic. Mouth: excellent, some ultra-classic totally malty extravaganza. Roasted pecans, peanut butter, sesame oil, marmalade, earl grey tea, black nougat (watch your teeth), praline, chicory, a tiny glass of Guinness (that’s what’s good when you’re an amateur, you may quote any brand names)... Finish: rather long, malty, a little more chocolaty. Toblerone (there) with a wee bit of Mars bar (there) and something too sweet by Kellog’s (there). No, this beautiful Glenrothes isn’t too sweet. Some mocha in the aftertaste. Excuse me? Okay, Illy’s Moka. Comments: very good. As good as truffle pesto. I mean, Sacla's Black Truffle Pesto (there). And so an old one, we said... Oh and let’s rather make it an OB! Another amazing bottle by the Highland Distilleries Company (now Edrington) that I had never seen before. Ever. It was distilled when Glenrothes Distillery was much smaller than it is today, with only four stills instead of ten. It is also to be noted that the stills were direct-fired, as they only switched to steam heating in 1963. Not sure about their maltings, having said that, but I suppose they were still malting themselves in 1947. I'd also add that while many wrote that the first official vintage bottling ever was 1979, this lovely little bottle proves otherwise, unless it's actually an indie bottling in disguise. Colour: amber. Nose: mushrooms and mosses at first, with touches of deep-baked beans and many old books. Clearly OBE-ed, but no accident so far. Old balms and embrocations, pinesap, pine needles, chestnut burr, then more and more and more freshly roasted coffee beans, as well as drops of soy sauce and beef bouillons, Bovril, Viandox, Oxo and ‘stuff’. You see what I mean. Mouth: mirroring the nose, word for word and flavour for aroma. Salty bouillon, chestnut purée, butternut squash soup, white beans, old pine liqueur that went dry, cough medicine, coffee (no sugar! ), and certainly quite some umami. A wee touch of paraffin that’s a little out of context, but that’s often to be found in these old bottles. Gets drier after oxygenation, and perhaps a little bitter. Finish: rather long, very meaty and salty. You could pour this over your tortellinis! Comments: I’ve very happy I could try this very meaty old glory. Isn’t that a blessing that some old casks of Caol Ila would still be available from some bottlers’ or brokers’? We’ve had some fantastic ones just a few weeks ago, so today our hopes are as high as, err, the Matterhorn. Grüezi! A name that’s perhaps a little less esoteric than others, but at least you’ll understand exactly what they are meaning at Wemyss’s. Unless that name was found on a Monday morning rather than on a Friday evening. This cask was bottled exclusively for the new Wemyss Malts Whisky Club. We’ve seen that before, haven’t we. Colour: pale gold. Nose: ah, rather one of those slightly acetic ones at first nosing, between almond milk, lemon juice and indeed white vinegar (a droplet, really). That works very well I have to say. Also green apples, then the usual fresh walnuts and carbon paper, engine oil, brand new woollen sweater, a little camphor, a touch of olive, some leather polish... It’s one of those whiskies that seem to be pretty simple and easy when you first nose them, and that would never stop evolving and getting more complex. There, whelks, new books, clams, hessian... Mouth: there’s an Ardbegness in this arrival, trust me. A tarry/petroly side, some old fisherman’s nets, then some more regular kind of smoky fudge, salted caramel, oysters, and the obligatory kippers. Very good, as expected. Finish: long, with a little green tea, ginger, green tannins, salted lemon juice... The signature’s a tad sweeter again, with a little lemon tarte (with meringue, naturally). Comments: the peat in these old Caol Ilas remains tireless. In theory, it should have started to vanish, but it looks like it did not, at all. Exactly that, a ‘Smoky Nectar’. A new series from Taiwan. We used to write that the whisky scene in Taiwan was burgeoning. Well, it’s now in full bloom! As for the name Kingsbury, it’s always been a very good sign, with only very few minor exceptions. Colour: gold. Nose: ha, it’s one of those Jamaican Caol Ilas again!. You know, when they start like some Hampden or Worthy Park, that is to say full of olives, brine, anchovies and grass smoke, before they become a little rounder, more coastal as well, a notch cleaner than our badass rums, and with more apple peels and rapeseed oil, which is always very Caol Ila in my book. And then, there’s this infernal trio, menthol, camphor and eucalyptus, then iodine. Cures anything. With water: and now bandages and ointments! And more fresh almonds. Have we already mentioned fresh almonds in these notes? Mouth (neat): very brilliant. Mangos and mint, olive oil, beeswax, ink... That’s all very typical, and totally ueber-class. With water: more salt, green lemons, oysters, bitter oranges, greens. Rocket salad. Finish: long, greener, more vegetal and herbal. And yet another dimension. Comments: I find it even more complex than some other sister casks/batches from those good people in Campbeltown. It’ll just need a little breathing. Like, open bottle, drink two or four shots, close, keep closed for one year, drink more. This is one of these releases which Bruichladdich seem to specialise in from time to time. On one hand it is 100% Scottish grown Optic barley, harvested in 2007 and distilled in 2008. But this is then full term matured in a mix of Port pipes, Cognac casks and 2nd fill American oak casks, while some parts begin in ex-bourbon and are re-racked into virgin oak and ‘ex-American whiskey casks’. Can you see the trees for the wood? Colour: burnished gold. Nose: There’s this rather familiar ‘Octomorish’ note of extremely salty porridge, porridge drowned in brine along with other crisp cereals such as smoked cornflakes, bonfire ash, hot smoked salmon and many sharper mineral salt notes. There’s a rather lean and cutting antiseptic note along with coal smoke and some raw petrol. Powerful stuff but you can feel the engineering of the wood with these notes of carbon paper and pencil shavings in the background. The whole feels pretty taut and edgy. With water: much smokier. Burning grass, wood smoke, kippers, soot, sawdust and old workshops. Some heathery smoke as well which is nice. Mouth: ooft! Extremely syrupy and oily in texture but in a rather extractive way. Notes of wood glue, tar, lemon oil, some rather foggy peat smoke and smoked meats. Also these hints of rubber fisherman’s boots (I eat them often!) and things like burning hay and silage. The gumminess of the wood is too much for me I’m afraid, it feels too convoluted and aggressive. Lots of hot black pepper. With water: some salted butter, beach pebbles, more tar. We’re getting back towards a straighter Octomore profile but it’s still tough. Some wood sweetness, limoncello and general salinity. Finish: long, spicy, rather a lot of antiseptic and medical notes mixed in with some pencil shavings and iodine. Comments: I’m not a huge fan to be honest. I just don’t see why you would convolute a great distillate and its noble but fragile base ingredients with such a chorus of different wood types. I don’t get a sense of balance or cohesion. But then again, it’s not my style so please take my score with a pinch of splinters. SGP: 677 - 77 points. Issued in 2018. This is quite a coup because as far as I know, Bruichladdich haven’t sold many casks of Octomore to third parties. I know, I tried to buy a cask myself when they were doing the first fillings and failed. Miserably. And funny that the distinguished Italo-German bottlers would have chosen an elephant for the label, are they suggesting this is pachydermic whisky? Colour: white wine. Chenin blanc (which is often very yellow). Nose: oh it’s pure! Angus, you we right, you’ll lose this one. Clay, lime, olives, mezcal, gentian, wool, coal smoke. The die is cast. With water: a littler simpler, so not sure water was obligatory. At this kind of age, no whisky will be really ‘complex’ anyway. But there’s not only complexity to whisky, mind you. Mouth (neat): this feeling of eating an ashtray in a Ibizan discothèque around 7am. No, never done that, that’s pure fiction. Pungent smoke, pine needles, green pepper, ginger, bitters, cigar smoke (in that very same discotheque, I would say). In the open, naturally, or you couldn’t smoke. With water: not too sure, once again. Gets a tad too green and gingery for me. That’s the oak speaking out. Finish: long, sharp, extremely smoky. Comments: this one’s very excellent indeed, it’s just that it does not need water. Well, it does not swim too well, actually. Next time, Port Charlotte! I have to say I always liked Port Charlotte rather better than Octomore. Anyway, Angus, you were right, I won this one. A little house that we follow and that we always like for its beautiful malternative qualities. This is 100% baco. Colour: amber gold. Nose: between a great Cognac and a great Agricole rhum. Please, don’t shoot! Perfect custard, crème brulée, raisins, cassata, maple syrup, roasted peanuts, a touch of sloe, cane juice, dried apricots, praline, then whiffs of rose petals and musk (old-school lady’s perfume), cigarette smoke… With water: amazing that it would like water this much. I’m think of lavender-flavoured crème brulée, which is a stunning dessert, believe me. Mouth (neat): wonderfully spicy and sweet, candied, honeyed… A whole palette of gingerbread, plus some mead, figs, prunes, various currants, dried pears… There’s also a funny feeling of botrytis, toasted and roasted… Really impressive if a little ‘modern’. But we cannot complain after having stated that Armagnac was remaining too old-school! With water: spices up, especially cloves. Oranges, and yet again a feeling of great rhum agricole. I am sorry! Finish: long, toasted, on roasted fruits, nuts and dates. Comments: extremely good, as expected. Perfect work with woods as well – which, in Armagnac, they couldn’t possibly call ‘wood technology’. Mind you, I’ve heard some own guns! Let’s see what this older zebra has got to say… Colour: amber. Nose: more coffee and chocolate, so more age and more wood impact. Torrefaction, Corinth raisins, clove essence, a box cigars (right, tobacco and cedar wood), really a lot of toffee, a thingy we had in France, called ‘Carambar’, a drop of pine essence… Let’s hope the oak won’t have won the palate here… Mouth: it did not, but that was close. Spicy oak, bitter chocolate, varnish, artichoke liqueur, cocoa, all-spice, Ricola sweets, wormwood, liquorice… In truth this is maybe a little heavy and a tad too concentrated. Just a tad. Finish: very long, pretty oaky, roasted, becoming a little bitter towards the aftertaste. Huge chocolate. Comments: excellent, it’s just that the 2001’s freshness was much more impressive. L’Encantada is another house that we enjoy a lot. They’re independent bottlers. Colour: deep gold. Nose: absolutely wonderful pastissy start, full of wormwood and liquorice, then caraway in abundance, marzipan, walnut wine, aniseed, and crème au beurre. It’s a very bright Armagnac, full of life and freshness. Mouth: in keeping with the nose, with bags of aniseed and wheelbarrows of liquorice, roasted pecans, fir tar, orange zests, plum jam, crystallised tangerines… How good is this? It is immensely good, and extremely malternative. A touch of green pepper too. Finish: long, wonderfully grassy, fresh, vibrant, fruity. Wild strawberries and mint leaves. Comments: totally impressed. A true malternative that would beat many very expensive malts fair and square. What we sometimes call a blind tasting star. Another favourite house! Colour: deep gold. Nose: more caramel this time, butterscotch, crème brulée, stewed peaches, crystallised quinces, cane syrup, then whiffs of rancio, mushrooms, toasted pumpernickel, chocolate liqueur… As great as expected, as always at Baraillon’s. Mouth: fudge-y madness, bags of jams and marmalades, a drop of pastis, liquorice, dried apricots, marmalade… What a whirlwind, what a maelstrom of flavours! Finish: long, luminous, fresh and fruity, and yet thick and candied. Love the liquorice in the aftertaste. Comments: unquestionable. And yet another top malternative, totally for dedicated Armaniacs. About to register armagnacjoie.com here. Not. Fully folle blanche this time! Colour: golden amber. Nose: get out of here, this is absolutely amazing. Parsley, marrow, apricots, mirabelles, cinnamon, chocolate, soy sauce, lovage, crude chocolate and coffee, peonies, honeysuckle, orange blossom, dates… The complexity is totally amazing here – and I’m sure I’ve missed 9 aromas out of 10. With water: ‘xtrordinary. Apricots and peaches out of control, yellow flowers (dandelions), honeys, sultanas… Mouth (neat): you brute! Huge Armagnac, it’s not that often that we come across such heavy hitters from Gascony. Bananas? Apricots? Muscat? Liquorice for sure. With water: do not add too much water or it would get a little too grape-y and lose the larger part of its complexity and brightness. Otherwise, apricots, oranges and plums. Cool. Finish: long, just a tad less interesting. That’s the youth, by law all aged spirits need time to become complex. Any peoples telling you otherwise are either salesmen, ignorant, or crooks. There. Comments: impressive young folle blanche by Castarède. Who needs malt whisky! I’ve been doing lots of rather long and silly tastings recently on these pages. Let’s try to redress the balance with a humble pair of what should, theoretically, be perfectly pleasing Glenlossies. ‘Scent Of A Woman’ relates to the film, not a tasting note. Colour: straw. Nose: slightly dusty to begin then hints of forest floor, white mushrooms, dill and some rather yeasty sourdough characteristics. Nice but perhaps a little simple and plain. Some very naked cereals lie underneath. With water: gets greener, grassier and gives up notes of chlorophyl, Barbour jacket and dried oregano. Mouth: more sourdough, white pepper, some lemon juice and a tad prickly on delivery. Touches of milky tea and a slightly hint of cardboard as well. Lots of damp grains, moss and plain cereals too. With water: slightly sooty, some dried herbs, wet leaves, more peppery notes, green tea. Nice, honest malt whisky. Finish: a tad short and crisp with some appetising dryness. Comments: Straightforward and easy, if a tad simple. I preferred it with a water. SGP: 441 - 81 points. Colour: light gold. Nose: a richer and pleasingly fat style. Lots of juicy clean malt, gingernut biscuits, cut grass, olive oil, yellow flowers and freshly baked pastries. Perhaps some have a few dollops of custard lurking within. Also some nice easy orchard fruits, some apricot, soda bread and calvados. With water: gets increasingly lemony - limoncello and rubbed lemon peel - and introduces notes of hawthorne, brown bread and some cashew nuts. Mouth: fresh butter with chopped parsley, sunflower oil, pumpkin seeds, lemon and poppy seed cake, matcha and cornflour. Some sweet gristy notes as well. With water: easy, straight, fruity, nicely cereal-forward malt whisky. No one will write it a love poem but no one would chuck it out of bed either. Finish: medium, again on cereals, lemon peel, tea and digestive biscuits. Comments: Another quaffable 93 Glenlossie by Cadenhead, although I preferred the 2017 bottling quite a bit more (WF 89). SGP: 551 - 84 points.